The fact that people start generating and sharing energy locally is not only a necessity to make the energy supply more sustainable, but also has the positive side effect of strengthening the cohesion in local communities. The advantage of citizens’ initiatives to generate local energy is that consumers become co-producers. Many people already install solar panels on their own roof and often there is still some space left to provide the neighbours with some clean electricity. When there is not enough space within urbanized areas, farmers or other land owners can also place wind turbines nearby. The solution is to combine renewable sources. The big plus of wind energy is that it is a more constant source of energy. This allows you to properly cover the energy gaps during the day! In areas with sufficient wind, the generation of wind energy is several times cheaper than storing all solar energy in batteries. To proper organize all this, we have to be able to exchange energy among our neighbours. 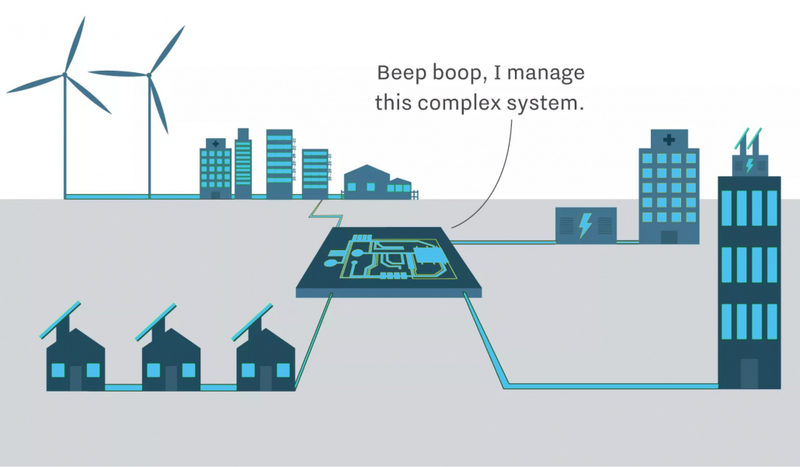 This is possible with a ‘microgrid’, a local interconnected energy hub which manages the production and distribution of energy. Local energy production requires that producers / consumers treat each other neatly and let the common interest be primal to self-interest. This brings along many benefits to local communities. Communities can become completely independent from energy generation, which means that they do no longer depend on the unreliable central grids. By generating all the energy in a renewable way, the costs of the now often expensive price of fossil fuel-fired generated electricity will drop significantly. In addition, the social component is very important. People discuss among eachother whether and how the system grows. Do we want to invest in wind energy or solar energy? How big and where can it be? Smart grids have to be built in the long term, so that anyone can give his excessively produced energy to a local resident. Soon consumers themselves decide what to do with energy surpluses to accelerate the transition to sustainable energy sources. The micro grids can be joined together to form a mini-grid and eventually all decentral grids combine will form the common network to supply all energy of a region, country, continent or even intercontinental.